When I started blogging over a year and a half ago, I really had no expectations of endorsements or sponsorships. I used to read style blogs and I loved seeing how women that I felt I could relate to were pushed to define their personal taste more clearly and pushed their fashion boundaries. I thought it would be fun for me to jump in and join the evolution. One of the best things about blogging is the opportunity to "meet" people from all over the world who share a love of clothes...and shoes and bags and jewelry. I've attended a few blogging conferences and even inadvertently formed a clique of "Baby Bloggers" at the most recent LuckyFABB while trying to figure out how to lug all our goodies home. All the speakers at these conferences say "Be yourself. ", "Work with brands you love. ", "Your readers will know when you are being fake or inauthentic. ", but no one actually tells you HOW TO WORK WITH BRANDS YOU LOVE or more importantly HOW TO NOT WORK WITH BRANDS YOU DON'T LOVE WITHOUT OFFENDING SPONSORS AND POTENTIAL SPONSORS. And that is how 20 months after I launched my blog, I ended up literally trapped in my heels! Last year, I attended a conference where I received a gift card for a popular and affordable shoe club. After checking them out, I realized that most of their items were "vegan leather," which as I've mentioned before kills me because it's pleather, People! It is vinyl or plastic or "man-made material," but it is NOT LEATHER no matter how much you qualify it. After mulling it over last year, I ended up buying a purse because I really didn't want any pleather shoes. Along with the bag, I received a necklace that was tarnished when it arrived and I ended up never wearing. During this year's conference multiple women were wearing shoes from this shoe club and they looked really cute. One blogger even told me that they are starting to add other designers besides their own line and I was impressed that she was still in her heels late in the afternoon. When I opened my gift bag and saw a gift card, I thought I would give them another chance and check out the website. I picked a pair of spring shoes, and was actually happy when they arrived because they seemed very sturdy. I quickly made up an outfit for them and went outside with my trusty tripod to take my outfit photos. I should have stopped when the zipper seemed really hard to zip up, but NO! I'm a determined little punk so...onward. After my faux-shoot, I came back inside to look at the photos and finish a load of laundry. I had decided I loved the outfit and would wear it to dinner with my husband and the kids. And then...I tried to take off the shoes. I could not get them unzipped. Either shoe. One zipper came about halfway down and kept getting stuck. The other came only about a third and then got stuck to where I couldn't zip it up or down. After yanking on the tab so hard that I hurt my finger I was horrified to find the zipper tab came off! It was less than a minute later that the other tab had come off and I was starting to really freak out! I emailed some blog buds for advice (Thank you Kimmie, Caroline, and Franziska!) and Morgan called me in the middle of incident. Everyone laughed because of course, I would end up trapped in my shoes. Some suggested butter to try to slip my foot off, others invited me to take a knife to them and EVERYONE said I should take photos and return them to the offending party. Once my husband came home and got over the horrified disbelief that I was stuck in these shoes, I had already cried and cursed and I was just tired and wanted them OFF! Being the awesome engineer that he is, he quickly found some pliers and freed me in a matter of minutes. The only question he had was "WHY did you buy such crappy shoes? I thought you knew better?!?!" I've never been more ashamed to admit to him that something was free. I was so embarrassed that I had been all too willing to sell out my soul (or in this case, my soles!) for a pair of not even great shoes. I have no one to blame but myself. I know that expensive shoes in general and designer shoes in particular are a hard, tough pill to swallow when it comes with a hefty price tag. I have no problem shopping at discount retailers (I LOVE Marshalls, TJMaxx, Nordstrom Rack, Last Call, etc.) and I don't mind scrimping and waiting for a great sale on clothes so that I can afford the shoes I love so much. I have a good reason for it (see my doctor's advice here) and I should have known better than to compromise who I am and what I believe because I didn't want to upset a sponsor of my favorite conference. The company is not at fault. They put out an inexpensive product for a cheap price and I chose to redeem my gift card. So I am not going to call them out by name, because it truly wouldn't be fair to them. They gave us a generous gift and it didn't work out for me, but I personally know many other women who love their product. I am very grateful to everyone that believes in me and to all the companies that I have been fortunate to work with. Not everything is a good fit for every single blogger and this was a big lesson to me about learning to say no. 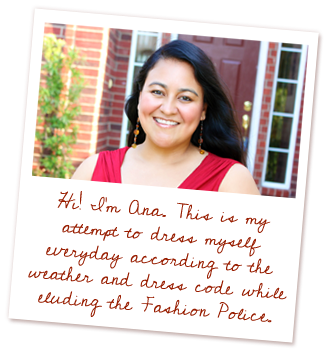 How do you remain true to yourself while navigating the c/o culture of the blogosphere? What is the best way to say "No" and be nice about it? in a nutshell i'm going to say this: there are probably way more bloggers out there who've sold their souls for cheap products, but will never admit to having done so. it's so much easier to profess your "love" for the items, slap a c/o on the post, and move on to the next free thing. not the route i'm choosing to take. i appreciate your honesty and hope other bloggers read this and learn a valuable lesson from it.